New Car Technology Tells Tailgaters To Back Off Ford is working with other major automakers to turn vehicle-to-vehicle communications technology into a basic safety feature of every car. The wireless technology sounds an alarm to alert drivers if they or another car pose a threat on the road. Ford's vehicle communications technology enables cars to talk to each other wirelessly using a short-range network. The system alerts drivers to a change in traffic patterns with red lights on the dashboard and an audible tone. This isn't exactly a new idea. A General Motors film from the 1939 World's Fair imagined a technology similar to what's finally making it onto roads today. In an empty parking lot in Washington, D.C., Ford Motor Company engineer Joe Stinnett demonstrates how its "intelligent vehicles" technology works today. He follows two other cars closely — too closely. It's the kind of scenario that often leads to 60-car pileups. "So, we're just going to drive down to the end of the track here," Stinnett says. "At the end of the track, the lead vehicle is going to hit the brakes. So, you can imagine if this was a foggy or snowy day with limited visibility, this would be even worse." All three cars are equipped with a small GPS and Wi-Fi unit, just like inside a smart phone. Ford is investing heavily in the technology and plans to launch a fleet of prototypes equipped with it this spring. The cost is pretty cheap — about $100 per car. And it lets cars communicate things like latitude, longitude and speed with one another at a range of about 1,500 feet. "They're monitoring the position of all the vehicles around you and determining who is an immediate threat to your vehicle — and what type of threat that vehicle is," Stinnett says. An alarm sounds in Stinnett's car because he's following the other vehicles too closely. "So, basically, what you saw was, you saw the lead vehicle's brake lights go off, and then you immediately saw the alert go off in this car — even before you had this vehicle ahead of you, before you saw their brake lights," he says. "So, you get that advanced alert." Ford is working with most of the world's other major automakers to turn this technology into a basic safety feature of every car. This vehicle-to-vehicle communications technology will be most effective if pretty much every car on the road is equipped with it. 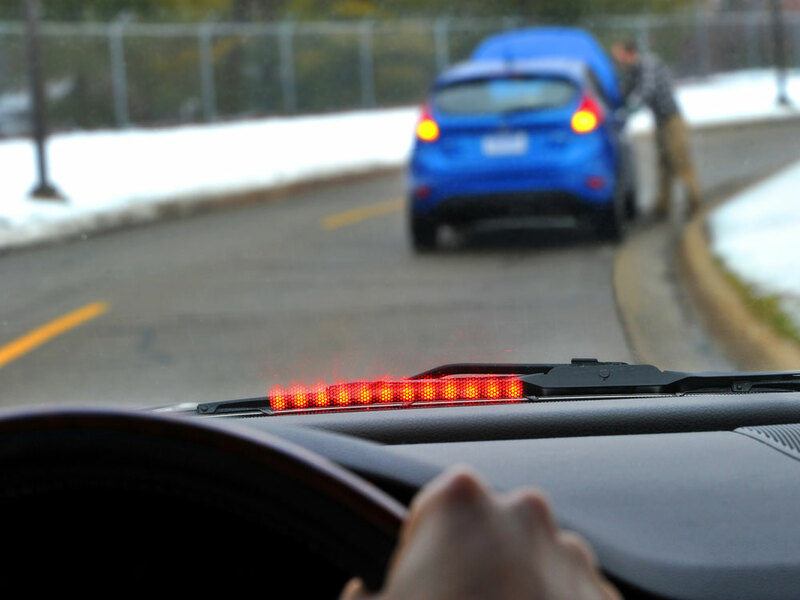 James Sayer, a safety expert at the University of Michigan Transportation Research Institute, says giving drivers a few extra seconds of warning before a crash could dramatically reduce traffic accidents. "It still is the case that the weakest link is the driver," he says. "The vast majority of errors in driving that lead to crashes are because of the driver. It's rarely the case that the wheel falls off." There is one concern about this technology that the auto industry is very sensitive to: privacy. After all, cars could soon be telling every other nearby car — and who knows who else — details about location, speed and where they've been in the past five minutes. Ford and other companies are trying to make that data as anonymous as possible. "The fact that we walk around the streets with smart phones all the time means that, essentially, the phone companies can track where we are if they wanted to, so I think there's lessening concern on the part of the public about the privacy," Sayers says. Limited trials of vehicle-to-vehicle communications technology will start later this year. If they're a success, the government could mandate that all cars be equipped with these devices before the end of the decade.